For the past 2 centuries, scientists, surgeons, shipping companies, and shoppers have relied on a common system of measurements: the metric system. The basic units of this system have their origins in Earth’s spatial dimensions, timescales, and material masses. As our ability to make measurements becomes ever more precise, these units have been redefined, one by one, in terms of fundamental physical constants rather than material objects—except for the kilogram. In an era where units are increasingly defined by the properties of atomic physics, Earth’s properties remain important in metrology, the science of measurement. This basic unit of mass remains tethered to a 139-year-old metal cylinder about the size of a plum that sits in air under three bell jars in France. But beginning on 16 November, that tie will be severed when the kilogram’s new physics-based definition is officially adopted. Scientists around the world rely on the International System of Units as a common basis on which to record and report their findings. The units used in this system are based on the meter, kilogram, second, kelvin, ampere, mole, and candela. Even though all scientific fields, including the geosciences, use these units every day, many geoscientists may not realize how important Earth’s properties were in developing these units and how the new definition maintains its ties to terrestrial dimensions. The change in definition shows that in an era where units are increasingly defined by the properties of atomic physics, Earth’s properties remain important in metrology, the science of measurement. Earth, which at the time was thought to represent imperishability and stability, was the initial base for the International System of Units (Système International d’Unités; SI) of length, time, and, indirectly, mass. Geodesy, the science of the shape of the Earth, its orientation in space, and its gravity field, was key in the definition of the metric system during the French Revolution. In 1791, the French Academy of Sciences defined the meter as 1/10,000,000 the length of a quadrant of Earth’s meridian. However, since 1983, the meter has been defined as the length of the path traveled by light in a vacuum during an interval of 1/299,792,458 of a second. Hence, c, the speed of light in a vacuum, was fixed to a given value, and the definition of the meter now derives from that of the second. Translating this concept into practical measurements requires some method that is both precise and repeatable. Several methods compete for the practical realization of the definition of the meter (also called mise en pratique). Today, the SI meter is often derived from the wavelength of an iodine-stabilized red helium-neon laser. By this definition, the above frequency (abbreviated in metrology to Δν(133Cs)hfs) is exactly equal to 9,192,631,770 transitions per second, and the second is defined accordingly. The kilogram is unique in that the standard is still based (for now) on a manufactured object rather than on a physical constant. In 1799, the kilogram was defined as the mass of 1 cubic decimeter of water at a temperature of 4°C. This unit is unique in that the standard is still based (for now) on a manufactured object rather than on a physical constant. The prototype kilogram from 1799 (the “kilogram of the archives”) and the present artifact from 1875 (the international prototype kilogram, or IPK) were manufactured to be consistent with this definition. The IPK is a cylinder of 39-millimeter height and diameter, made of 90% platinum and 10% iridium. At present, the IPK is kept at the Bureau International des Poids et Mesures in Sèvres, France. Forty replicas of the IPK were manufactured in 1884, and 34 of them were distributed to the signatories of the Meter Convention. The United States was allocated prototype numbers 4 and 20; Belgium received numbers 28 and 37, and Switzerland got number 38 and, more recently, number 89. These replicas have been used as national standards ever since. 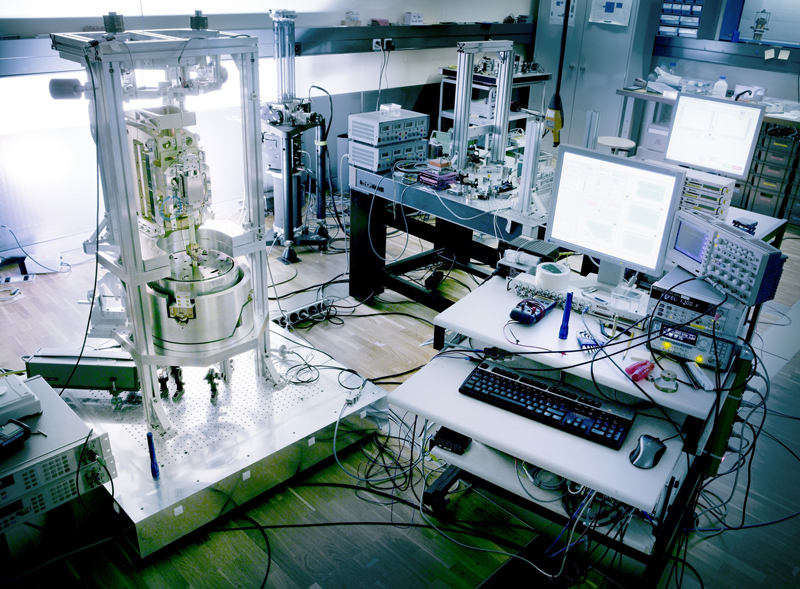 The kilogram is scheduled to join the other SI units, and its prototypes are scheduled to become museum items when the kilogram is officially redefined in terms of the Planck constant. This change in definitions is necessary because the use of the IPK, a physical artifact, poses various problems. There is no way to ensure its long-term stability, it might be destroyed or damaged, and it poses logistical problems when it has to be compared with copies at other national metrology institutes (NMIs). Comparisons of the mass of the IPK to those of official copies and the national prototypes in 1889, 1948, 1989, and 2014 indicated that the IPK seems to have lost about 50 micrograms over 100 years (five parts in 100 million). It is also possible that all the prototypes show a common mass drift, which cannot be detected by intercomparisons. We thus face a strange situation: By definition, the mass of the IPK is invariant, but there is no means to check its stability using an absolute reference! The instability of the IPK propagates to other base units that are tied to the kilogram, such as the candela (luminous intensity), the mole (number of atoms in a mass of material), and the ampere (electric current). It also influences the derived quantities such as force, density, and pressure. Consequently, for the past 25 years, several NMIs have been working to replace the IPK with a definition based on a fundamental constant of nature [Richard et al., 2016]. Although Earth’s properties are not stable enough to serve as a basis for the SI, geodesy has not said its last word. The new definitions of the second and the meter, previously derived from geodesy, now rely on laboratory physics experiments. The new definitions, however, must be consistent with the previous ones and are thus still related to Earth’s shape and motion. On 16 November 2018, the 26th CGPM will ratify the revised SI based on seven constants: the frequency of the ground state hyperfine splitting of the cesium-133 atom Δν(133Cs)hfs, the speed of light in vacuum c, Planck’s constant h, the elementary charge e, Boltzmann’s constant k, Avogadro’s constant NA, and the luminous efficacy Kcd. These constants exist independently of our ability to measure them, and thus, the definition and practical realization of the units will be decoupled. The practical derivations of mass can be established and replicated by different experiments with ever-increasing accuracy, while the definitions remain unchanged. In short, this means that the practical derivations of mass can be established and replicated by different experiments with ever-increasing accuracy, while the definitions remain unchanged. Henceforth, the magnitude of the kilogram (kg), the unit of mass, will be derived from the value of Planck’s constant (h = 6.62607015 × 10−34 joule-seconds; see Fischer and Ullrich ), used in Einstein’s energy formula E = mc2 = hv. Because a joule is a kilogram meter squared per second squared (kg m2/s2), the kilogram standard will now rely on SI units of length and time, which were already previously standardized. Just how do we derive the kilogram from those known quantities? Another route to the kilogram is based on the Kibble balance [Robinson and Schlamminger, 2016]. In this scheme, the mechanical power of a mass in a gravitational field is balanced by the electrical power of the balance. The kilogram depends on Planck’s constant, which appears in the quantum phenomena used to determine the balance’s current and voltage. Knowing the current, voltage, length, and time to measure the velocity of the coil moving within a magnetic field and the local acceleration of gravity, one defines the mass as the amount of matter required to balance a given amount of electrical power. To allow this derivation of the kilogram, the gravity acceleration must be determined at the 10-8 level by absolute gravimetry, tracking the free fall of an object or cold atoms repeatedly dropped inside a vacuum chamber [Van Camp et al., 2017]. Since 1967, geodetic metrology is no longer required for the definition of the meter and the second. However, gravity will still be key in the new realization of the kilogram. A measurement of Avogadro’s constant could be converted to a measurement of Planck’s constant h (and vice versa) through Rydberg’s constant, which links the atomic and macroscopic properties of matter. The new constants will not be completely divorced from their historical ties. The number chosen for the numerical value of h will be such that at the time the definition is adopted, the redefined kilogram will be equal to the mass of the IPK within the uncertainty of the combined best estimates of the value of Planck’s constant. The same holds true for c and Δν(133Cs)hfs, which, like h, remain historically related to the Earth’s dimension and rotation. The accurate gravity measurements required to determine the kilogram using the Kibble balance would not have been possible without research to measure and monitor gravitational acceleration and to understand its variations in time and space. The accurate gravity measurements required to determine the kilogram using the Kibble balance would not have been possible without research to measure and monitor gravitational acceleration and to understand its variations in time and space [Van Camp et al., 2017]. Geoscientists have worked on this problem since Galileo Galilei investigated the motion of falling masses in the 16th century and showed that acceleration due to Earth’s gravitational field is the same for all masses (and thus cannot be used to define any specific mass, including the kilogram). However, using the Kibble balance method requires dropping objects, not to measure their mass but to determine an accurate value for gravitational acceleration. Thus, monitoring the free fall of an object or cold atoms, as achieved in absolute gravimeters, is still a fundamental tool in geosciences and metrology. After November, our meters, kilograms, and seconds will be defined by the motions and energy of electrons, atoms, and photons. However, the benchmarks by which we bring these definitions into everyday use remain rooted in measurements derived from our home planet. This article is dedicated to the memory of Jean O. Dickey, a geodesist at NASA’s Jet Propulsion Laboratory, who passed away in May 2018. 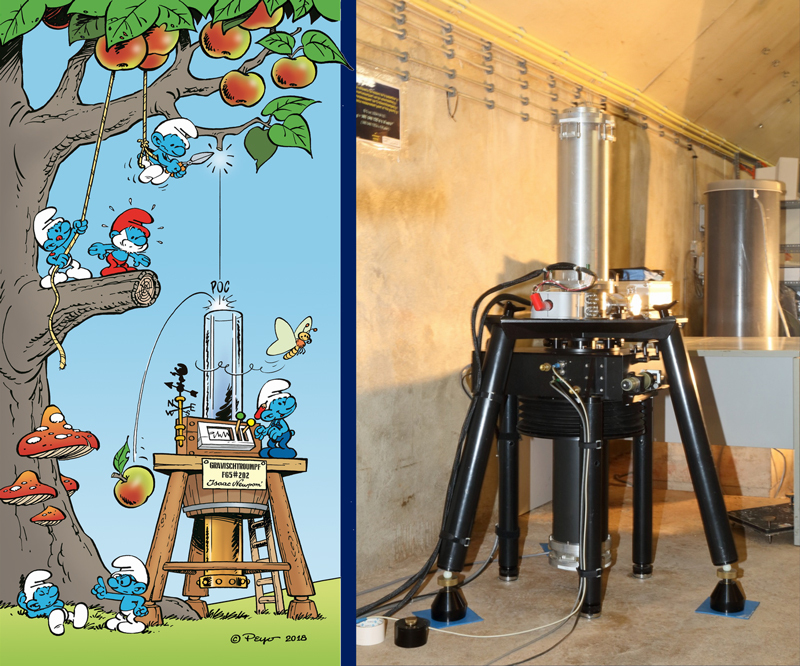 She measured gravity using satellite data, and she was a great fan of the Smurfs. The authors thank Miguel Diaz Vizoso and IMPS for the beautiful cartoon. Fischer, J., and J. Ullrich (2016), The new system of units, Nat. Phys., 12(1), 4–7, https://doi.org/10.1038/nphys3612. Richard, P., H. Fang, and R. Davis (2016), Foundation for the redefinition of the kilogram, Metrologia, 53(5), A6–A11, https://doi.org/10.1088/0026-1394/53/5/A6. Robinson, I. A., and S. Schlamminger (2016), The watt or Kibble balance: A technique for implementing the new SI definition of the unit of mass, Metrologia, 53(5), A46–A74, https://doi.org/10.1088/0026-1394/53/5/A46. Van Camp, M., et al. (2017), Geophysics from terrestrial time-variable gravity measurements, Rev. Geophys., 55(4), 938–992, https://doi.org/10.1002/2017RG000566. Citation: Van Camp, M. J., P. Richard, and O. de Viron (2018), Universal units reflect their earthly origins, Eos, 99, https://doi.org/10.1029/2018EO109747. Published on 14 November 2018.